Ankle x-rays are required if only if criteria below are fulfilled. 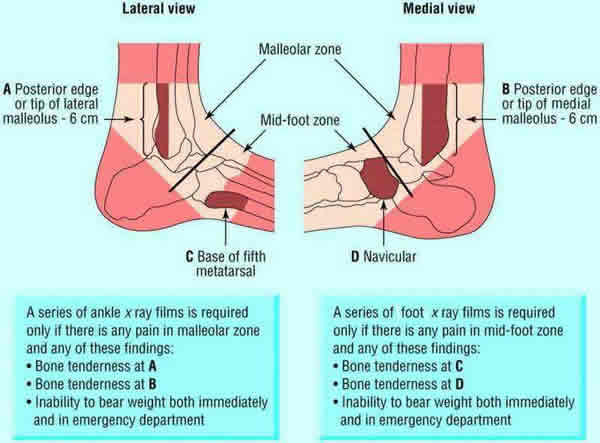 Remember to x-ray the foot if there is bony tenderness over the navicular or base of 5th metatarsal. Treat by ice (if recent), elevation and active exercises when elevated. In the case of a bad sprain, the above treatment is best supervised by direct referral to physiotherapy. If undisplaced, treat with below-knee POP and refer to the Fracture Clinic (CUH Fracture Clinic Referral form). CUH EM and Orthpaedic divisions have (Feb 2013) reviewed the literature (including the 2012 Oct CEM guideline). Prophylactic anticoagualtion is not required those pateints discharged in a backslab. If diastasis, obtain X-ray of whole leg. May occur from a fall onto the heels or with "simple" inversion ankle injuries. If in doubt - request axial X-ray. If the sub-talar articular surface is involved, refer to the on-call Orthopaedic Team for admission. 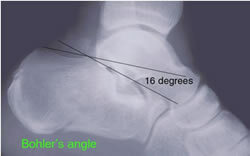 Gross disruption of the subtalar joint is indicated by a flattening in Bohler's angle (should be 30° - 40°). If there is no sub-talar involvement apply a well padded POP backslab, advice, no weight bearing and provide crutches. Arrange a Fracture Clinic appointment. Thompson test - lie prone and calf squeeze produces plantar flexion in normal individuals). 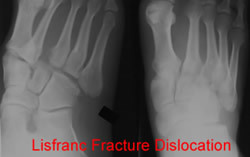 The six bone tarsometatarsal complex is known as the lis franc joint. Injuries uncommon, but up to 20% are missed. Force of injury variable and can be minor rotational to severe axial load. In most injuries involve disruption of the joint and associated fractures of metatarsals, cuneiforms and cuboids. A fracture at the base of the 2nd metatarsal is pathogmonic of disruption of the ligament complex. Elevation when not walking on it, exercises. Review in clinic only if difficulty mobilising. POP only if patient unable to weight bear at all. Transverse fracture of shaft of little metatarsal. Very different to pull off fracture as above. 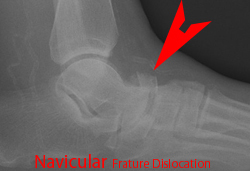 Unstable as peroneus (brevis) tendons distract fracture and mal/non union likely. Ice, elevation and exercises. POP may be helpful if multiple fractures. If compound treat as for compound fractures plus soft footwear. Content by Dr Íomhar O' Sullivan 14/03/2004. Reviewed by Dr ÍOS 06/01/2005, 17/07/2005, Dr Chis Luke 17/07/2005, ÍOS 08/02/2007.Last review Dr ÍOS 19/01/15.